Many Aikidoka I know, practise other martial arts besides Aikido. Mostly swordstyles or other eastern martial arts like Judo, Karate Tai Chi etc. I’ve wanted to do so too for a long time, but never really knew what kind of martial art it should be for me. And now, at the age of 43 and after 20 years of Aikido, I finally took up the challenge and started training BJJ alongside Aikido. A strange combination it may seem, but for me it works out great so far. This choise made my budo-year a special one and it was a turning point in my path. I’m training both Aikido and BJJ a couple of times a week. It’s funny; One day I’m a (reasonably) avanced 3th dan Aikidoka and the next day I put on my white belt at BJJ and I find myself struggling with new techniques and body mechanics. “Where’s the fun in that?” you might wonder. I guess you have to feel it for yourself to understand. Maybe it’s easier to stay with one craft, but to me it’s very rewarding to finally be training more than one martial art. I’m exploring my limits and expanding my horizons on another level now! In one of my first BJJ classes, during sparring, I wasn’t able to escape from under the guy on top of me. No matter how I tried, he simply put me under a lot of pressure and here I was…on my back gasping for air and moving like a fish on the dry. It was pretty uncomfortable and finally I had to tap to get out. And he didn’t even apply a choke or an armbar yet… Wow, what happened there? After this experience it would have been the easiest way to thank the BJJ teacher for the lessons, wish him all the best and stick to my Aikidopractise. 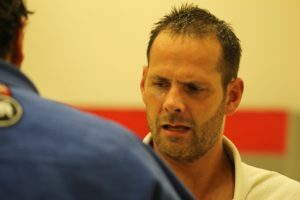 But strange enough, this feeling of discomfort I had experienced, became my motivation to continue BJJ! I wanted to learn to handle myself in these situations. I’m now training BJJ a little over a year and I am -ofcourse- still very much a beginner. But, I’m also getting used to the dynamics and I like it. And a fine side effect is, that when I teach or train Aikido, I am now even more aware of the confusion beginners must feel on their new path. One of my teachers told me once that comparing different martial arts, like Aikido and BJJ, is like comparing soccer and volleyball by saying they’re the same because they both use a ball and a net … We all wear a gi and practise pins and throws…. This simple lesson stuck with me. In Aikidotraining there’s no competition or sparring. The focus in training is not to fight, compete or win. We train primarilly to develop a strong and balanced body and spirit. By doing so, we will grow as persons and -hopefully- learn to deal with the challenges our daily life presents us. 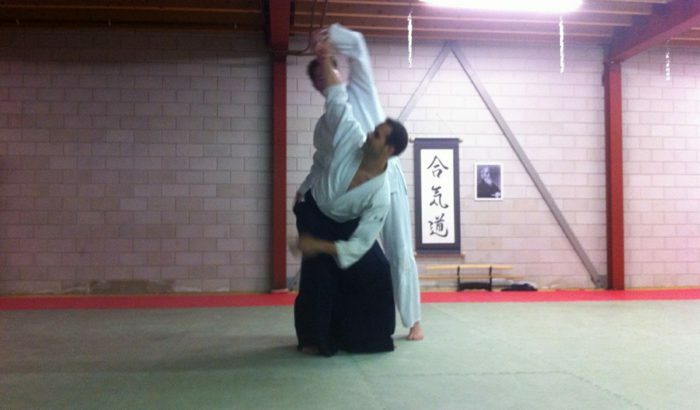 Training partners in Aikido help each other improving their technique, for instance by giving good and sincere attacks. 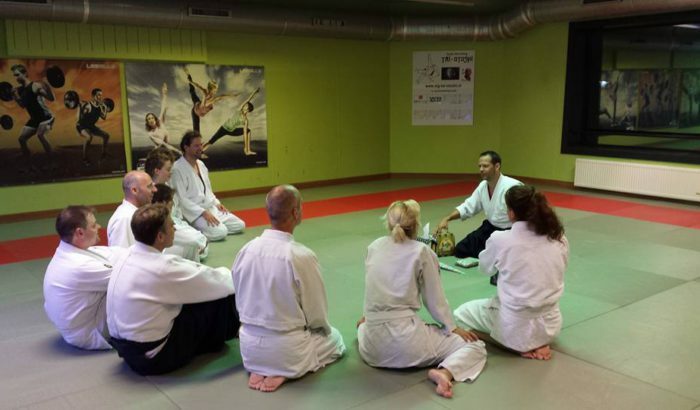 Don’t get me wrong, Aikidotechniques can be very confronting and can also be used for self defence, although this last aspect is not very much emphasized in many dojo’s. IS ONE BUDO BETTER THAN ANOTHER? At the end of the day, to me, this all depends on everyones personal drives and ambitions. What do you want to learn? Listen to your inner voice and it will guid you to the right place to practise. There is lots of depth and value to find in every martial art as long as it’s practised with the right mindset. Walking around in these two different worlds the past 14 months, I have learned that the athmosphere in both worlds is one of respect and friendship. People from all over the world and from all walks of life are practising together. 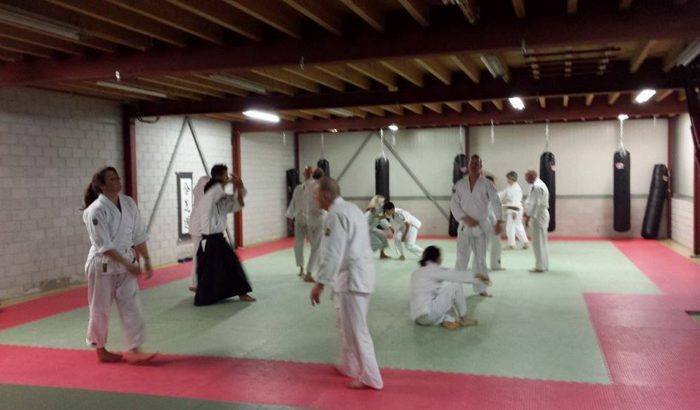 On the tatami we are all there for the same purpose; to enjoy our training together and develop ourselves. As long as you are willing to train hard and bring a positive mindset to the mats, there’s room for everyone! With a new year around the corner I wish all of you well! Stay in good health and enjoy whatever martial arts or other way of life you want. And if you ever have the chance, step out of your comfortzone and try something new. 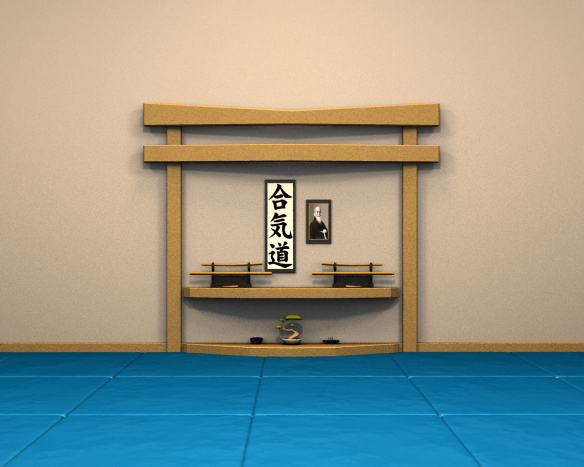 Just know you are allways welcome in my dojo to try Aikido!